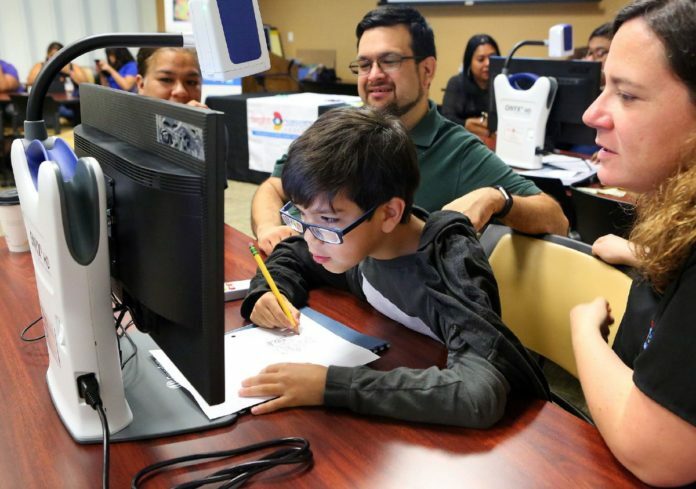 Gavin Merrell, 10, uses an electronic video magnifier to aid his sight as he writes, as twenty-six students received visual assistive technology by Sight Savers America at Region One Education Service Center on Wednesday, Sept. 12, 2018, in Edinburg. EDINBURG — As he walked into the room, Eric Longoria found his way through tables, chairs and people with the help of his cane and his mother who walked by his side. The 17-year-old was diagnosed as legally blind soon after birth and on Wednesday, he received a new magnifier to help him gain more independence. Eric was one of 26 children with severe sight impediments from across the Valley to receive an electronic video magnifier to take home — free of cost — courtesy of Sight Savers America, a nonprofit aiming to provide free eye-care and vision services to qualifying individuals throughout the country. The estimated cost of the equipment is about $2,500 per unit, and this is the first time the nonprofit visits the southernmost region of Texas. The magnifier allows users to enlarge text and images near and far, up to 118 times its normal size for users with low vision. They can also change color, contrast, adjust the field of view, among other adjustments to prevent them from forcing their vision. Sight Savers of America is based in Alabama but serves the entire country by partnering with entities, such as Region One Education Service Center in this case, to select a first group of children or adults to receive the equipment. For children, the age is usually 5 to 18 years old, but it varies based on need, Daw said, and the nonprofit will provide technical support and follow up with the children up until they turn 19 years old. The nonprofit operates based on grants, which they apply for on behalf of a specific area and then they see how many machines can be provided with the grant money received. Once they have a group of recipients selected, a group of specialists like Daw visits those areas and get the families set up with the equipment. This is the first time the nonprofit receives funding for the Rio Grande Valley area, but there are plans to apply for more funds in the future. “This is going to help a lot with homework,” said Nataly Muñoz in Spanish. Her 8-year-old daughter Ruth Muñoz received a magnifier. Most parents were notified via their school officials after being contacted by Region One Specialist Twinkle Morgan. On Wednesday afternoon, Daw sat with Eric and his mother for about half an hour to explain how the equipment can be used. Eric quickly got the hang of it and found that it was easier for him to read white lettering on a black background. He enlarged the text as much as needed and read a few paragraphs from the screen in front of him while adjusting the book on his hands to follow the text with ease, and even locked the screen to write a few words, which were carefully aligned over the line. This was not possible at home, his mother explained, as he constantly needed help making sure he could align his writing, and read as much as he could. Eric, who attends Harlingen High School South, says he has similar technology at school, but was excited to try this new equipment at home and have more freedom to do his work or hobbies on his own.